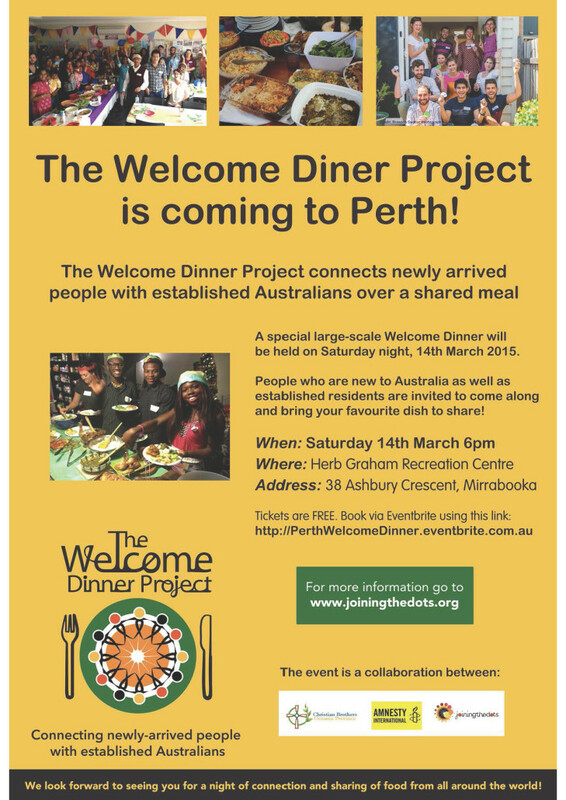 I would like to tell you about an exciting initiative coming to Perth – The Welcome Dinner Project. Welcome Dinners enable newly arrived people and local Australians to meet over dinner conversation in the comfort of local homes. The project evolved out of hearing from both new and established people that they were struggling to find ways to connect at a personal level. 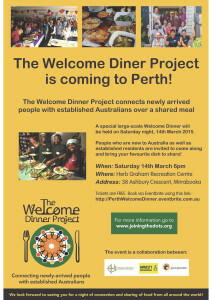 Each dinner has an equal mix of established Australians and newly arrived people from across the world – they could be international students, migrants or refugees – with the intention of friendships sparking between people of diverse cultures who are living in close proximity to one another but have not yet had a chance to meet. The Welcome Dinners are pot-luck style, so everyone brings a dish from their culture to share. Trained Welcome Dinner Facilitators are always present to lead the activities and offer support to the host. If you have any questions or would like to talk more about the project please contact me.